Not sure how to start your career as a science writer, or how to take your existing career to the next level? 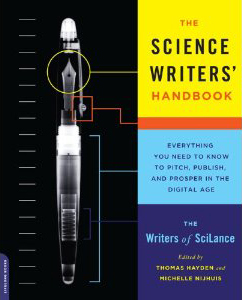 The Science Writers’ Handbook is here to help. In this essential guide, 35 leading science writers share their hard-won wisdom and illuminating stories, going beyond the basics to cover everything else you need to survive and thrive as a science writer. Just some of the topics in the book include finding sources, landing clients, writing queries, contract law for writers, business strategies, and establishing the balance between work and life. From how to structure a story, to dealing with perennial writer’s downfalls like envy, procrastination, and loneliness, to finding health insurance and doing your taxes, The Science Writers’ Handbook is your comprehensive guide to the craft, culture, and commerce of the profession. This book was supported in part by a Idea Grant from the National Association of Science Writers. This portion of the ScienceWriters (www.NASW.org) website is home to Pitch Publish Prosper, the online resource for The Science Writers' Handbook and its companion books, The Science Writers' Essay Handbook and The Science Writers' Investigative Reporting Handbook. Run by a professionally diverse group of 31 science writers, Pitch Publish Prosper offers timeless advice on a variety of topics relevant to new and practicing science writers — everything from career ennui to contract negotiations. The Science Writers' Handbook and its spinoff titles were each supported by an NASW Peggy Girshman Idea Grant. We are happy for the opportunity to provide a place where the associated content of these books and the creativity that spawned them can continue to grow and reach new audiences. Pitch Publish Prosper (sciwrihandbook@gmail.com) is editorially independent of the National Association of Science Writers.